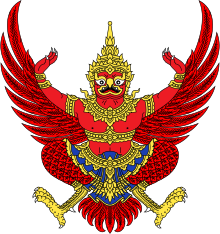 Kru Pol Muay Thai Seminars USA – BRING THAILAND TO YOU! @ YOUR LOCATION! Kru Pol Muay Thai© / USA! 3x Thailand Champion! Muay Boran Assistant Grand Master! Wai Kru Ram Muay and Philosophy! Muay Thai Punches and Kicks! 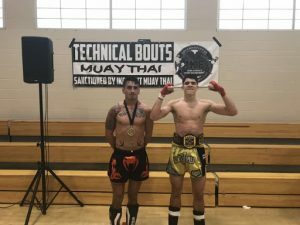 Muay Thai Clinch and Sweeps! 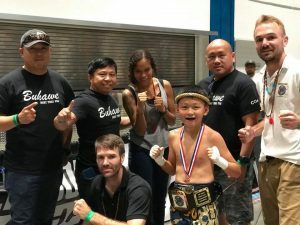 If you want to learn authentic Muay Thai in the USA… from a native of Thailand and lifetime practitioner … Invite Kru Pol and learn her unique perspective on Muay Thai and how to improve your skills as she clearly articulates each technique! 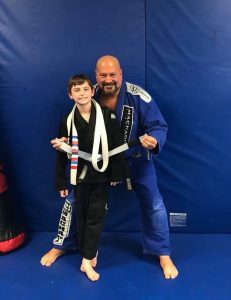 Accredited by the World Muay Thai Boran Federation and the Kru Master Muay Thai Association, Kru Pol Muay Thai© is based out of New Bern, NC and is available to travel across the country to bring you valuable tools to pass on to your students! 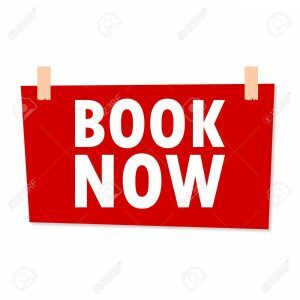 Book Your Seminar Today! Click Here! Special Introductory Limited Discount Offer! Below Kru Pol talks about her Seminars and more! Men, Women and Children will compete in Semi Contact IKF Point Muay Thai / Kickboxing and win great awards! Saturday, April 27th in Columbus, GA! Come be apart of this exciting event with the great team at Bad Apple and the IKF PKB Organization! Men, Women and Juniors as young as 5 years old can compete in this semi contact competition where knockouts are not allowed! More information on rules at www.IKFPKB.com. 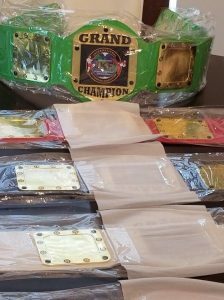 Receive nice trophies and awards including some will get a chance to fight for our Signature IKF PKB Grand Champion Belt! Register form From Front Page of Site! Main Trainer with 3 or more Fighters get in free! Joseph Creer with this team! 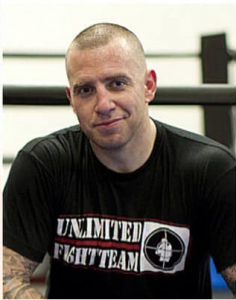 IKF PKB Promoter, Mr. Corey Grant presents his Second IKF Point Muay Thai Sparring event that will host men, women and children in semi contact Muay Thai action! Nice awards will be given for this exciting event were knockouts are not allowed but the action is awesome! 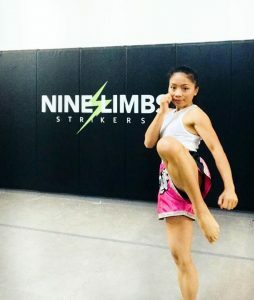 Kru Pol of New Bern, NC and owner of Nine Limbs Strikers Muay Thai / Kickboxing Club is inviting you to her Third IKF Muay Thai / Kickboxing Sparring Event! Men, Women and Junior will compete in semi contact Muay Thai Sparring and win nice awards! There are no knockouts but the action is fast and exciting! Fighter Registration on Front of site! 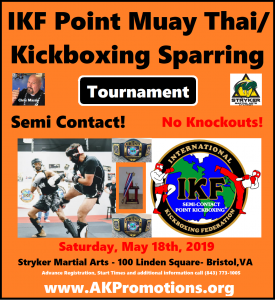 Join IKF PKB Promoter Mr. Chris Massie and his Strykers Martial Arts Academy for an exciting edition of IKF Point Muay Thai / Kickboxing Sparring Tournament! This is a semi contact event! Knockouts are not Allowed and full gear is required! Sparring is done on a matted floor…Not in a Boxing Ring! Please take note. Men, Women and Children can compete as young as 5 years old! Bring your entire team! 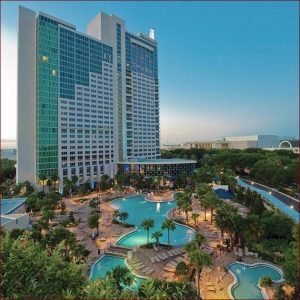 Advance Registration is $35 but will be $45 on the day of the event. Nice awards will be giving to the winner who outscores their opponent. 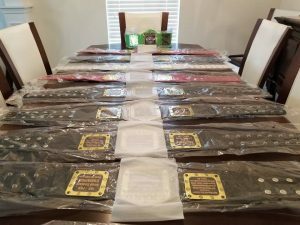 Trophies to first place winners…Medals to runner ups – Some lucky divisions will be Sparring for our Signature IKF PKB Belts…More information contact IKF PKB Promoter Mr. Chris Massie at (423)963-4050 or Johnny Davis at (843)773-1005 for Rules etc. Join Mr. Ivan Ramos and Mr. Daniel Hodges as they bring you one of the most exciting semi contact events in the country! 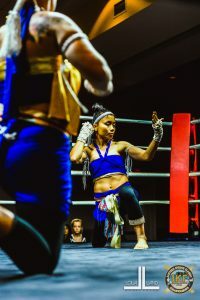 IKF Point Muay Thai Sparring is a great event for all of your students at assorted amateur levels to compete, win nice awards while improving their skills! Contact them to become a part of Team MAESH for another exciting event on in San Leandro, CA! Men, Women and Juniors 5 years and up compete in semi contact IKF Muay Thai Sparring Action! 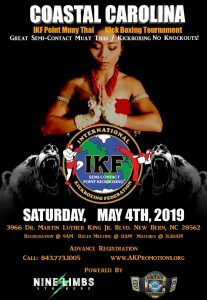 Join Panther Muay Thai of Rocky Mount, NC for an exciting IKF Point Muay Thai Sparring Tournament that will host men, women and children in semi contact sparring action! IKF PKB Sparring Tournaments are sanctioned events that are safe for all competitors from 5 years old and up… and are super exciting for spectators! The fighters use their techniques to try and outscore their opponents that include boxing, kickboxing and knees to the body in a semi contact format! Fighters also win nice awards! Knockouts are not allowed! More Information to come…You will be able to register in advance on this site from the front page…You will be able to register at the door for the event as well starting at 9:AM on May 28th! This is one of the largest IKF Point Muay Thai Kickboxing Sparring events in the area! You can be assured that you will get first class competition and have a great time! 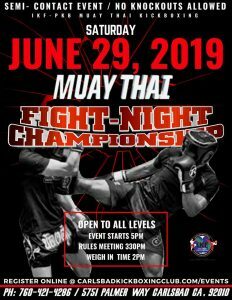 Mr. Jacob Douangdara presents another IKF Point Muay Thai Sparring Tournament that will host the best of local Muay Thai fighters in semi contact action that will thrill fight fans! Knockouts are no allowed in the fast paced sparring tournament but you will not want to miss all the actioned- packed bouts that will show the best of Muay Thai Techniques! Men, Women and Children 5 years and up will compete for nice awards! Men, Women and Juniors in Semi Contact Action! No Knockouts Allowed! 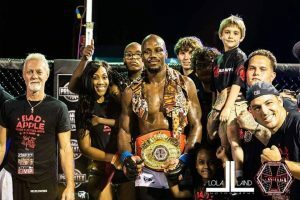 Mr. Don Rodger, with his 9th Edition of Lightning Strikes Triangle Kickboxing Promotions, is presenting another exciting full contact show that will feature some of the best professional and amateur Kickboxers in the Southeastern Region! Visit Triangle Kickboxing Promotions for more information or to learn how to get on the card. Join Mr. Chris Clodfelter for another exciting event at his Eight Point Muay Thai Club in Winston Salem, NC. This is another great event by Mr. Clodfelter’s and he has a stall of talented men, women and kids that will give you great competition! Register online now and save or at the door between 9:AM and 11:AM. Rules and matching at 11:00 and competition starts at Noon. For Questions, contact Mr. Clodfelter at (336)403-4493 or Johnny Davis at (843)773-1005. Register from front page of this site. This is a Semi Contact Point Muay Thai Sparring Tournaments. No Knockouts Allowed! Men, Women and Children! IKF Point Muay Thai Sparring Tournament! Rocklin, CA! Men, Women and Juniors in exciting Semi Contact Action! Hope to see you there! Register today! Semi Contact! No Knockouts Allowed! Kru Dan and Ying King are inviting You to Return to this wonderful Sparring event on SUNDAY, July 14th, 2019! Men, Women and Juniors Compete for nice awards in Semi Contact Muay Thai / Kickboxing Sparring Action! No Knockouts Allowed! Safe and Fun for all levels! Nice Awards! Trophies, Medals and a Signature IKF PKB Sparring Grand Championship Belt! Register online here or at the door! More information, contact Mr. Dan or Mrs. Ying King at (704)779-8742. Register in advance online or at the door starting at 1:PM- 3:PM – Presented by Black Belt USA – $35 Advance Registration and $45 at Door. Register below and save! Note: Main Trainer Gets in Free- Additional Free Passes for trainers may be available based on how many fighters you register. Thanks in advance for your support! 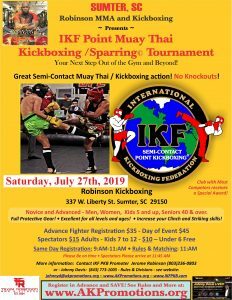 Kru Pol of New Bern, NC and owner of Nine Limbs Strikers Muay Thai / Kickboxing Club is inviting you to another IKF Muay Thai / Kickboxing Sparring Event! IKF Point Muay Thai Sparring Tournament! San Diego, CA! There will be Minimum Registration at the door and may be cut off completely depending on Advance Registration numbers! You are encouraged to register in advance! If you are not there for rules meeting and matching you will not be able to fight. Thanks for your understanding. Thanks too for your patience during the matching process, safety is paramount in this semi contact competition. There are no refunds for this event. PS we are also expecting a good turnout…so please do not wait to the last minute to register as we may have to cut off registration early. Thanks for your understanding. Note: There will be some gear to use if needed at the event. Note: Adults and 150 and above Juniors wear 16.oz Gloves and other juniors wear 12oz gloves to be determined at matching. Safety First! Semi Contact – No Knockouts Allowed! Official IKF PKB Equipment Provided By Blackout Sports – Buy Your Gear Today! Only 4 Fighters Per Division! Registered Fighters Brackets Coming Soon…Early Registration is recommended! If you register at the door, you may only be able to register in a division that has fighters! If 4 fighters, two winners will fight for first and 2nd. 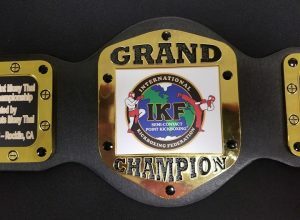 Special Notice: You can compete in the IKF PKB “Semi Contact” Sparring tournament for only $45 if you competed in the 2019 IKF World Classic “Full Contact” Tournament and not injured. (TKO or Ko’d etc) This would be if you lose out in the preliminary match. If you will be fighting on Sunday in the World Classic, you cannot compete in the PKB on Saturday. REGISTER FOR THE 3rd IKF WORLD CHAMPIONSHIP / POINT MUAY THAI KICKBOXING SPARRING TOURNAMENT! AT THE WORLD CLASSIC IN ORLANDO, FLORIDA ON THIS SITE! 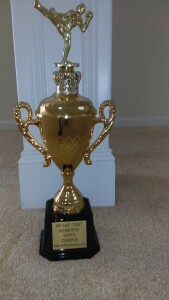 Fighters in the Novice Division ( 3 fights or less or under 4 years of training) will win a Cup Like shown above. Fighters with over 3 fights or over 4 years of experience will fight for a belt as shown below. Register by deadlines and save! 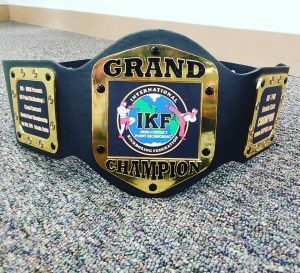 The IKF World Kickboxing Classic is one of the oldest Kickboxing Tournaments in the United States and has hundreds of registered fighters from around the world! We are expecting a good turnout of men, women and juniors as we have had over the last 5 years! Feel free to give us a call at (843)773-1005- you can register from the front page of this site! Club entering the most fighters in the IKF PKB will receive a special award! REGISTER FROM FRONT PAGE OF THIS SITE! IF you have a fighter competing in the World Classic Full Contact divisions…your Trainer Registration is Complimentary! Spectator Fees for the IKF PKB is $20- If you were a spectator at the World Classic, you will receive $10 Discount on your PKB Entry Fee. Trainers and Fighters from the IKF World Classic will get in Free! IKF PKB Official maintains the right to use larger gloves than listed based on appearance of competitors for greater safety measures. Any matches outside of these weight classes must be approved by Adult Fighter and, Trainer or Guardian. 3. 110 lbs. – 120 lbs. 16 oz. 4. 121.1 – 130 lbs. 16 oz. 5. 131. 1lbs. – 140lbs. 16 oz. 6. 141.1 lbs. – 150 lbs. 16 oz. 7. 151.1 lbs. – 160 lbs. 16 oz. 8. 160.1 lbs. – 170 lbs. 16 oz. 9. 170.1 lbs – 180 lbs. 16 oz. 10. 180.1 lbs. – 190 lbs. 16 oz. 11. 190.1 lbs. – 200 lbs. 16 oz. 12. 200.1lbs. – 210 lbs. 16 oz. 11 210.1lbs- 220 lbs. 16oz. 13. 250 lbs. – Above. 16 oz. IKF PKB Official maintains the right to use larger gloves than listed based on appearance of competitors for greater safety measures. Any matches outside of these weight classes must be approved by the Trainer of fighter and, or Parent or Guardian. 2. 50.1 lbs. – 60 lbs. – 12 oz. 3. 60.1 lbs – 70 lbs. -12 oz. 4. 70.1 lbs. – 80 lbs. -12 oz. 5. 80.1lbs. – 90 lbs. -12 oz. 6. 90.1 lbs. – 100lbs. – 12 oz. 7. 100.1lbs. – 120 lbs. -12oz. – 16oz. 8. 120.1 lbs. – 130 lbs. -12oz. – 16oz. 9. 130.1 lbs. – 140 lbs. -12oz. – 16oz. 10. 140.1lbs. – 150 lbs. – 16oz. 11. 150.1lbs. – 160 lbs. – 16 oz. 12. 160.1 lbs – 170 lbs. -16 oz. 13. 170.1 lbs. – 180 lbs.-16 oz. 14. 180.1 lbs. – 190 lbs. – 16 oz. 15. 190.1lbs. – 200 lbs. -16 oz. 16. 200.1 lbs. – 210 lbs. -16oz. 17. 210. 1lbs. – 220 lbs. -16 oz. 18. 220.1 lbs. – 250lbs -16 oz. 19. 250lbs – Above – 16 oz. 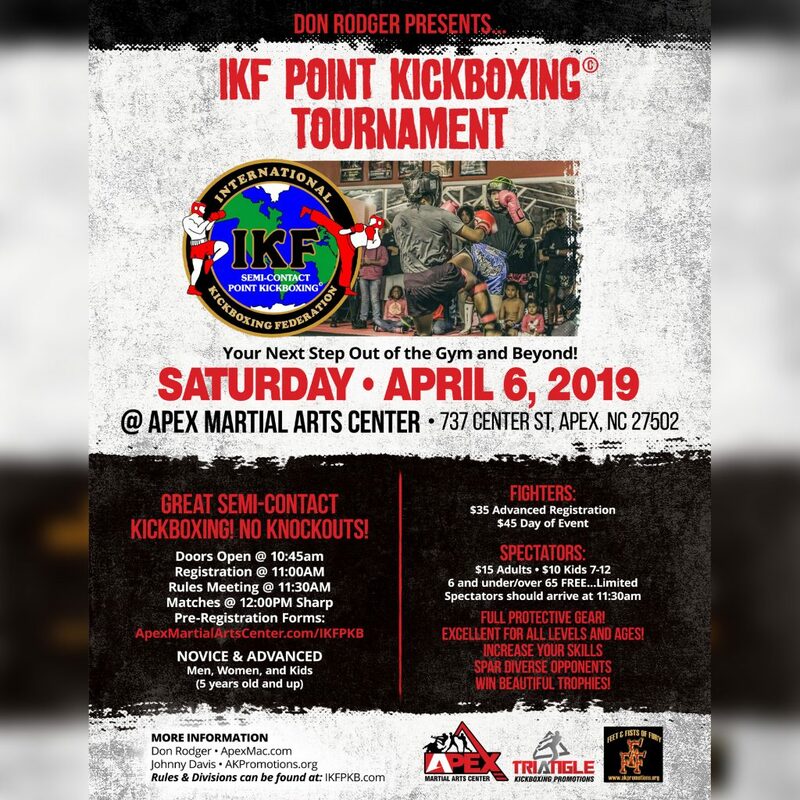 IKF Promoter Don Rodger of Triangle Kickboxing Promotions out of Apex, NC Presents his 10th edition of IKF Point Muay Thai / Kickboxing Sparring Tournament! Each tournament in the past has grown and again we are expecting a solid crowd! You can register in advance for $35 and save money! Spectators are $15 in advance and $25 at the door. Register now @ the link above! Doors open at 10:45am. Registration: 11:00am, Rules Meeting 11:30am, Matches start at 12pm. Note: Fighters and Spectators should not arrive too early. Doors will not open until 10:45am and competition will not start until 12pm. Come witness men, women, juniors and those over the age of 40 compete in exciting semi-contact Kickboxing Action! No Knockouts are allowed but you will enjoy the real fighting dynamics of Kickboxing! See you there! To register for this event or to purchase spectator tickets, please visit apexmac.com. For more information contact Mr. Don Rodger at (919) 230-9583, or more on rules at www.IKFPKB.com or contact Johnny Davis at (843) 773-1005. Join Mr. Chris Clodfelter for another exciting event at his Eight Point Muay Thai Club in Winston Salem, NC. This is another great installment of his tournament and he has a stall of talented men, women and kids that will give you great competition! Register online now and save or at the door between 9:AM and 11:AM. Rules and matching at 11:00 and competition starts at Noon. For Questions, contact Mr. Clodfelter at (336)403-4493 or Johnny Davis at (843)773-1005. Men, Women and Juniors 5 years and up compete in semi contact Muay Thai Sparring Action!